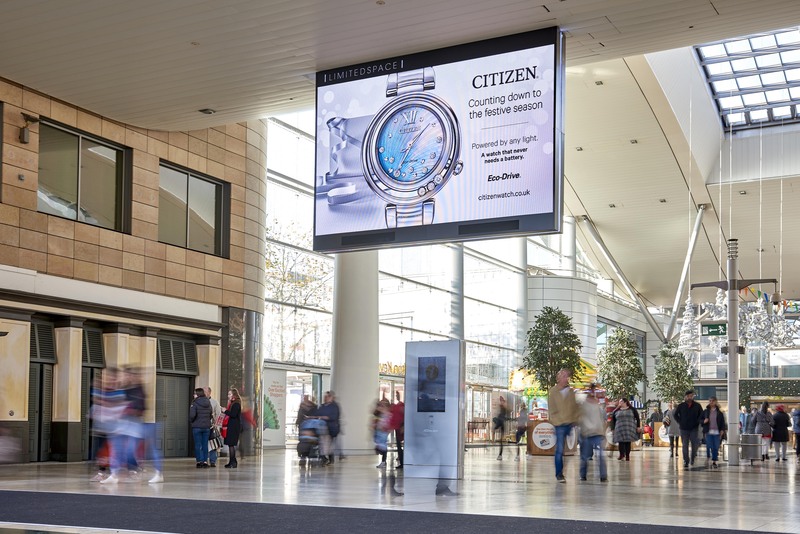 Limited Space, market leaders in retail and lifestyle destination media is collaborating with Citizen Watch UK to bring the market’s first real-time digital watch dial to life as part of Citizen’s Autumn / Winter advertising. The campaign features the ladies’ Citizen L Sunrise watch dial with live, animated hands that represent the exact time in line with Greenwich Mean Time (GMT), all as part of a unique sponsorship campaign that sees Citizen become the official timekeeper of 11 retail destinations across the UK, providing consumers with a countdown to Christmas. Citizen will also be rolling out brand video advertising across the screens during December for Citizen and Frederique Constant brands. Using Limited Space’s Orbit network, which consists of 14 large format landscape digital screens, the Citizen campaign will be exposed to over 40 million people over a 2-month period in the run up to Christmas. Samantha Sida, C0-founder and CSO of Limited Space, said, “We are excited that our full motion digital media can help bring Citizen to life using dynamic onscreen elements. Making Citizen’s elegant creative a real-time presence will engage consumers in a completely different way and deliver a reassuring touch from a global brand known for precision and innovation.